I'm working downtown again and thus taking the El to work. 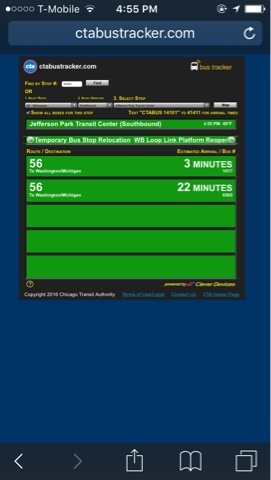 On my trip home, I use CTA Bus Tracker to see if its better to catch the bus at Irving Park or Jefferson Park. The problem with the IP bus is that it takes forever for it to get across Pulaski, Keystone and then the actual Blue Line station at the Kennedy Underpass. Also IP going west at rush hour is usually a nightmare so even if I catch it, I usually make better time walking. However, it seems that the bus at Jeff Park is not much better option. Usually I'm going to just miss one bus but have to wait nearly 20 minutes for the next one to leave. Which again will be up against rush hour traffic and take an additional 20 minutes to get to my stop. On Friday I actually had to wait half an hour for the bus which surprisingly got me home rather quickly. A passenger who got on at the Wilson Stop scolded the driver for being so late. She said that it was because of the traffic on the inbound route. I was going to complain to the CTA about this and I might still voice some concern. However, it isn't the driver's fault that they don't have enough buses on this route that covers a wide portion of Chicago. There has to be a better solution. Update: I realized belatedly that the countdown is just until a bus gets to the terminal. It usually sits for a spell, usually but not always until the next bus arrives. A more accurate indicator would be seeing how long until a bus is going to get to Milwaukee and Lawrence. If the time is less than 3 minutes that would imply that the bus has left Jeff park terminal.